The first time diabetes landed Richard Perez in Providence Portland Medical Center, the homeless man was discharged with little more than a bottle of pills and a bus pass. “You’re putting me out just to the streets, and I’m having all these meds, carrying them around with me,” Perez remembers thinking during his discharge last spring. It wasn't until Richard Perez, who has diabetes, lost his leg after being struck by a car that he was finally able to get temporary housing and regular access to medicine that has stabilized his blood sugar levels. In December, Perez landed back in the Providence medical center after a car hit his right leg. His diabetes, rampant from the poor diet and rough life on the streets, made that wound a crisis. Doctors gave him a choice: Lose the leg or lose your life. This time, when Perez left the hospital, a van drove him to a new home in downtown Portland’s Henry Building. The nonprofit Central City Concern runs a Recuperation Care Program there for homeless adults who need regular nursing after a hospital stay. Providence paid roughly $4,000 for Perez to get 30 days in a small, tidy room, nutritious food and regular care for his amputation site, while staff helped him look for benefits and stable housing. Perez shows both sides of a system that tries but often fails to protect homeless people leaving local hospitals. Portland is one of a few dozen U.S. cities with “respite care” programs to help the homeless recover medically, and Central City’s program is something of a national model. But Portland’s programs don’t come close to meeting the full need. Homeless people recovering from poisoning, broken bones and other conditions that don’t need intense post-hospital care are often left to fend for themselves in Portland’s fragmented, underfunded network of homeless services. Some get discharged back to temporary shelters where they can get a few nights in a bunk. Others just return to the streets, until they get sick enough to land back in the hospital. Portland’s homeless population is especially sickly. A survey of 646 people sleeping outside in Portland last October found nearly half had asthma, hepatitis, heart disease or other conditions that make them “medically vulnerable.” More than 40 percent of the people surveyed said they visited an emergency room at least three times in the previous three months. The revolving door between the streets and the emergency room affects anyone who uses a hospital or has health insurance. The 646 people surveyed used almost $1.5 million in ER services in 2008. Since two-thirds of the surveyed were uninsured, that totals $1 million in unpaid bills — losses that get passed on to paying patients through higher hospital charges and insurance rates. City officials estimate that 4,000 people sleep in shelters or outdoors each night, and the actual toll of unpaid ER costs for the homeless could be roughly $6 million. Local hospitals say that, on an average day, more than a dozen homeless people are spending the night as inpatients, adding millions more to the annual cost. No one tracks how many of these patients get discharged to a street in Old Town, where Portland’s homeless service agencies cluster. But workers at those agencies say they commonly see people seeking help, still wearing their hospital wristbands. “Sometimes we’ll get people in our lobby, and I’m like, ‘How did you get down here? How are you back on the street? '” said Andrew Anderson, outreach chaplain with Portland Rescue Mission’s men’s shelter. At nearby Union Gospel Mission, staff have “dealt with three or four people recently who have hospital tags on their arm, who were just released and don’t know what to do next,” communications director Stacy Kean said. One man in particular sticks in mission manager Taylor’s mind. Local hospitals are in a bind when they have to discharge homeless people. It’s unethical to send patients into a dangerous situation. But hospitals can’t keep healthy homeless patients. That would just fill up beds sick patients need and court bankruptcy. “The hospital’s not designed to be a shelter or a hostel or a domiciliary. They’re designed to be a profit-making enterprise,” said Jason Renaud of the Mental Health Association of Portland. Federal law and accreditation rules require hospitals to make discharge plans for each patient. But nothing bars discharging someone to a homeless shelter or a part of town with homeless services. Discharge planners at Providence, Oregon Health & Science University and Legacy Health System handle homeless patients in similar ways: Case managers look at a patient’s diagnoses and resources to help them apply for housing and other benefits, such as Social Security. Sometimes case managers help patients contact friends or family who may provide a bed, even for a while. If that fails, the hospitals consider a program such as Central City Concern’s. As a last resort, case managers call temporary shelters, hoping to snag at least a few days of food and rest. The shelters usually try to make space for just-released patients, though they are often full, especially in winter. So some homeless patients get sent from local hospitals with just a list of shelters and a travel voucher. Although OHSU won’t discharge homeless patients to an unsafe place, care manager Paul Vergeer said, some just get cab or bus rides to Old Town. And some are OK with that. “A fair number really don’t want to go to the shelter. They’d rather sleep under a bridge somewhere,” said Robin Weisshaar, manager of social services at Legacy Good Samaritan. The realization that hospitals and homeless agencies were trading clients back and forth spurred the search for a humane solution. Providence made an early effort, paying Central City Concern to offer shelter and care to discharged homeless patients. But that program had “way too many barriers” to succeed with homeless patients, said Ted Amann, Central City director of health care, including bans on guests and alcohol and a 9 p.m. curfew. The nonprofit’s Recuperation Care Program began in 2005 when OHSU decided to try a similar approach with fewer restrictions. It began with just a few beds, program manager Nic Granum said. Impressed by the results, OHSU expanded the project, and Providence, Legacy and other Multnomah County health providers signed on. Today, the program has 25 small rooms in the Henry Building. Hospitals pick whom to send through the program and pay roughly $4,000 per patient, depending on their insurance. The hospitals also agree to give a month of medicine and specialty care for free. Program staff help residents care for their injuries and look for jobs, benefits and more stable housing. Most residents go on to live with friends and family or move into transitional or permanent housing, Granum said. Though they hate talking numbers, the Recuperation Care Program seems to save hospitals millions. Over three years, OHSU leaders say they paid Central City $500,000 to take patients, which averted $3.5 million in costs OHSU would have paid for housing or retreating the patients. And “if a hospital’s willing to publicly say $3.5 million, I’m thinking the real number is between $10 and $15” million, Amann said. Support from hospitals is key to the program’s success. The federal government has no steady funding for medical respite care for the homeless, said Sabrina Edgington, a policy analyst with the National Health Care for the Homeless Council. Budget woes have closed many programs that weren’t funded by hospitals or cities, she said. That fate killed an infirmary trying to fill the biggest gap in Portland’s respite care system, help for homeless people who are sick but don’t need daily nursing. In late 2005, OHSU and the Salvation Army opened a 15-bed infirmary on the second floor of the Salvation Army’s Harbor Lights shelter downtown. “A fair number of people came in throughout the week, or were dropped off by taxicabs,” said manager Marna Flaherty-Robb, then-associate dean of OHSU’s School of Nursing. But demand soon outstripped the infirmary’s resources. It was hard to find enough volunteers to staff the program. Donations used to fund the infirmary started to run out and the Salvation Army had many demands for that space, Flaherty-Robb said. The program petered out in early 2007. 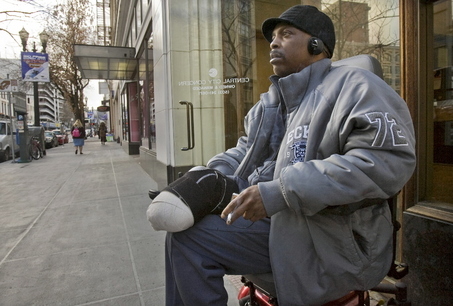 Housing moderately sick homeless people remains a big hole in Portland’s safety net. Portland’s Ten Year Plan to End Homelessness lists not transferring people from hospitals to the streets as a top priority. But the plan’s funding is focused on the toughest cases: addicts, felons and other chronically homeless, single adults who use the most resources. The consequence is that couples, the sober and the simply sick have the hardest time finding help. The economy also may test the Recuperation Care Program. It’s never operated in a recession, and though hospitals save in the long run, they must spend up front to send patients through. Meanwhile, demand probably will rise as more people are pushed out of homes. But for Perez, life is looking up. With decent food and regular access to medicine, his blood sugar stabilized in his month at the Henry. Earlier this year, he moved into the Clark Annex, a supportive housing unit run by Transition Projects Inc. And last week, he was approved to move into a new apartment complex on Northeast Martin Luther King Boulevard. OUR COMMENT – Best wishes for good health to our friend David Yandell and a good transition home. The comments received at the Oregonlive site in response to this article were disturbing. Addiction issues and criminal activity were seen as personal choices to disengage from the system, not symptoms of underlying social or mental health issues. Many of the people leaving comments showed hostility toward the idea that Perez should receive any help from society, given his previous disengagement. Apparently there are still lots of folks who believe the disabled and unwanted should be left outside to die of exposure, as was done in Greece 2,000 years ago. It is well known that our social “regulations” give enough freedom to be interpreted in the way we find suitable in various situations when needed.